So take your bike for a walk. 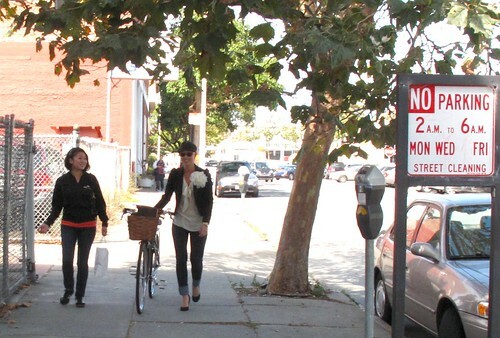 In San Francisco, it's actually against the law to ride a bike on the sidewalk. However, there are some city streets with neither bike lanes nor sharrows where it's downright scary for a cyclist to ride alongside cars (I live at the corner of such a street). Providing no bike lane on highly car-trafficked streets therefore gives the cyclist no options - one must stop, dismount and walk - defeating the very purpose of being on a bike! In these situations, what's a city cyclist to do? Abide the law or defy it? Seriously, people ride the sidewalk when they have no choice and nobody cares, especially the police which has better things to do. I believe that if riding on the sidewalk is the safest option for a piece of journey, cyclists should ride on the sidewalk. However, the first step is a commitment by cyclists to REALLY respect pedestrians while riding, which means dismounting when there's a ped ahead, and treating any person walking with the utmost respect and friendliness! I think it depends on the situation. If it's a crowded or really narrow sidewalk, you should probably walk. But if you have room, and you're not going to be crowding people off the sidewalk, go for it, especially if you're just going a short distance to bypass a particular nasty bit of road. i think in san francisco there is almost always a way to find a safer street and avoid riding on the sidewalk. got almost hit by a bike on a sidewalk a few times with my infant daughter in the stroller and must say that now i watch out for bikes on the sidewalk as mush as for cars turning around the corner. i usually walk on lincoln where any cyclist can just ride one block up to irving and ride on a safer street and avoid the sidewalk altogether. I appreciate all your comments! I don't condone flat out riding on the sidewalk when there are clearly other options. But in the case where there aren't any other options, then cyclists who choose to ride on a sidewalk need to be courteous of and respectful to pedestrians. We are entering their domain, after all. Where would be an example of a street segment where it's scary to ride alongside cars in SF? It's also fairly dangerous to the cyclist to ride on sidewalks in some situations (being hidden behind parked cars from a car turning into a driveway, for example), so while I admit doing so on occasion, it has to be done with the utmost care, and usually so slowly that you're going barely faster than walking anyway. Abide the law by taking the lane? I'd probably look for a better route, myself. Then again, I live in the 'burbs and have bike lanes everywhere. I live at the corner of Fulton & Stanyan. I have to ride up Stanyan street on my way home from work. Stanyan has a wide sidewalk and NO BIKE LANE. Stanyan also has two car lanes going North and two going South, which are almost always packed, in addition, two buses travel up and down Stanyan. Rush hour on this block is insane. In the morning the cars consistently try to cut off pedestrians. There is also a busy hospital with an emergency room on the same block. This street is also full of potholes and a friend of mine sustained a major injury from falling off her bike and hitting her head on the pavement (helmet was torn off of her head on impact) while riding in this street. 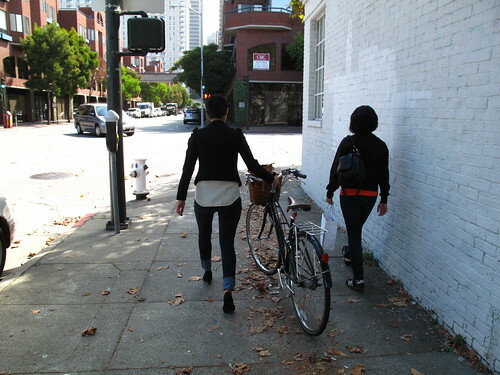 I ALWAYS ALWAYS opt for the sidewalk when riding on Stanyan and not one pedestrian has ever complained to me. "Abide the law or defy it?" Another easy question; yes. The tricky questions are why, when and how. kfg - yes to which one? both? I never ever ride on the sidewalk -- except for one little box intersection where the use of rough Belgian pavers for the crosswalks make it far too danger to ride a narrow-wheeled bike across. Then I have to jump onto the sidewalk, jump back down onto another street, swing around the crosswalk, and then on and off a sidewalk again. But other than that it has never occurred to me to ride on the sidewalk, no matter how dangerous I think the street is. But every town is different, and when I'm not riding in the city to work, there are no sidewalks where I ride anyway. I think it's super important that if bikes are going to ride on the sidewalk that we be extra cautious and deferential to pedestrians. Rude bikes on sidewalks create a huge amount of bad will. That said, one spot where I sometimes take the sidewalk is on Divisadero going west up the hill from Fulton. There are two lanes of screaming fast traffic, no bike lane, and an extra wide, lightly used sidewalk. Jeremy, Divis goes N to S. And I think you mean Masonic?